It’s July, and this month Google is rolling out a new rules for how secure and non-secure sites are displayed. Why am I seeing a Not Secure warning? Are other site visitors getting a warning? What does Not Secure even mean? How long has my site been showing this warning? Should I be panicking? Panic is an appropriate reaction, right? We see this a lot — and it’s never the end of the world. Your site is fine. You’re fine. But you do need to take action. Your visitors will see it, which isn’t a great look. So to get rid of that Not Secure warning once and for all there are some simple, often free, steps you’re going to want to take. Want a solution as fast as possible? Do you have an SSL certificate installed on your site? Or, if you’d like to learn more about SSL, HTTPS, and why you’re seeing the warning, read on. So many acronyms, so little explanation. What does this all mean? Hop in our Wayback machine and let’s go back to the distant future — the early 1990s. You may remember that since those days, sites on the World Wide Web started with “http://” (You may ever remember learning that HTTP is an acronym for “HyperText Transfer Protocol”). Another, less common protocol was hanging around back then too — HTTPS. As the name suggests, it’s awfully similar to HTTP — it’s just an extension that provides an extra layer of security. This more secure protocol wasn’t widely used back then, but it’s slowly become more common over time. At this point, anyone saying you don’t need to set up SSL is stuck in the past — they’re the same as those that said “We don’t need our site to work on phones” in 2008, and “We don’t need a website, the internet is just a fad” in 1998. To run on https, a site will need to have a valid SSL (Secure Socket Layer) certificate installed and configured. Either a site has an SSL certificate installed and configured (Secure!) or they don’t (not secure!). If your site is displaying a Not Secure warning, it means that SSL isn’t installed, or it’s installed but not configured properly. Before 2017, Google’s Chrome browser would tell you if a site was using https by displaying a nice green icon and “secure” message. It’s quite possible this icon has appeared next to your URL for ages and you’ve never noticed it. The icon effectively says that your site isn’t using https, it’s just very subtle: Only when a user clicks the icon for more info will they get this more dire-sounding warning. Since then, times have changed. And the times, to paraphrase Bob Dylan, are still a-changin’. Beginning in July of 2018, Google Chrome is displaying that Not Secure warning on sites without SSL at all times — not just when a visitor is using a form. It’s not a great impression to make. That’s a good looking message: It’s green, it’s got a lock icon, and it says Secure. Other browsers are following suit. No matter what browser your visitors are using, HTTPS is the way of the future. Rather not have to worry about any of this? Get $200 Off Our Done-For-You SSL Installation & Configuration Services. …Going at it yourself, eh? I like your initiative. Let’s get you off to a good start. That’s ok, a lot of our clients come to us not knowing if they have SSL installed or even what SSL is. Luckily, we can find out if you have SSL on your site — and it only takes three steps and about 10 seconds. The results will come up within seconds. If you see a bunch of green check marks like the example above, you’re in good shape and you have SSL installed. If the SSL Checker shows that SSL is set up but you’re still not getting the green “secure” message in your address bar, check out these possible reasons and solutions. If you get a red or yellow warning sign, that means you don’t have SSL installed. Read on and let’s look at what you can do. Good news — chances are you can install SSL on your site without needing outside help. Better yet, it probably won’t cost you a dime. That’s thanks to a service called Let’s Encrypt — a free, automated, and open certificate authority. So how do you install SSL using Let’s Encrypt? Check out this list of web hosting providers that support Let’s Encrypt. Once you find your provider, click on the “Source” link beside it to open up instructions specific to your host. Once you’ve got your SSL certificate installed and configured, you should be the recipient of a nice, new, green “Secure” message in your browser. But if you’re still getting a Not Secure warning, read on and we’ll solve what else might be the matter. If you know you’ve got an SSL certificate but your site isn’t giving you that nice green icon, there are a few things that may be at play. Let’s look at each. 1) You have an SSL certificate, but it’s not installed or configured properly. Maybe when you bought your domain name or hosting, GoDaddy or whoever sold you an SSL certificate at the same time. In fact, logging into your account shows you’ve got SSL — so why isn’t it working? Well, maybe your provider made sure it was installed and configured properly… but maybe they didn’t. Talk to your domain registrar, ask them to configure your SSL certificate, and see if they’ll refund you for the months you weren’t using it. 2) You’re not forcing https. Take a look at your URL in your address bar. Does it start with http or https? If it starts with http, that means you’re loading the standard version of the site. To load the secure version instead, go up to your address bar and add an “s” after the http so that it says https, then hit enter. If your SSL certificate is installed properly, you’ll get that delightful green “secure” message that we want to see. What you’ll want to do is force https — effectively forwarding anyone who visits the non-secure http version of your site to the secure https version. How do you force https? There are all sorts of ways depending on how your site is set up and how technical you want to get. If you’ve got a WordPress site and don’t want to edit code, try the Force HTTPS Plugin by LittleBizzy. It’s well-rated, regularly updated, and does the job. If you’re more comfortable with code can access your site files via FTP, you can edit .htaccess following these instructions to force https. Or if you use Flywheel — the hosting we recommend to our WordPress Concierge clients and use ourselves — it’s as easy as flipping a switch. This is a likely culprit if your URL starts with https but you’re still not getting that nice green icon. Basically, while your site is secure, it’s calling some sort of file or asset on another site insecurely. That could be content hosted on another site that doesn’t use https, or it could be a link to your own site’s content that accidentally starts with http instead of https. 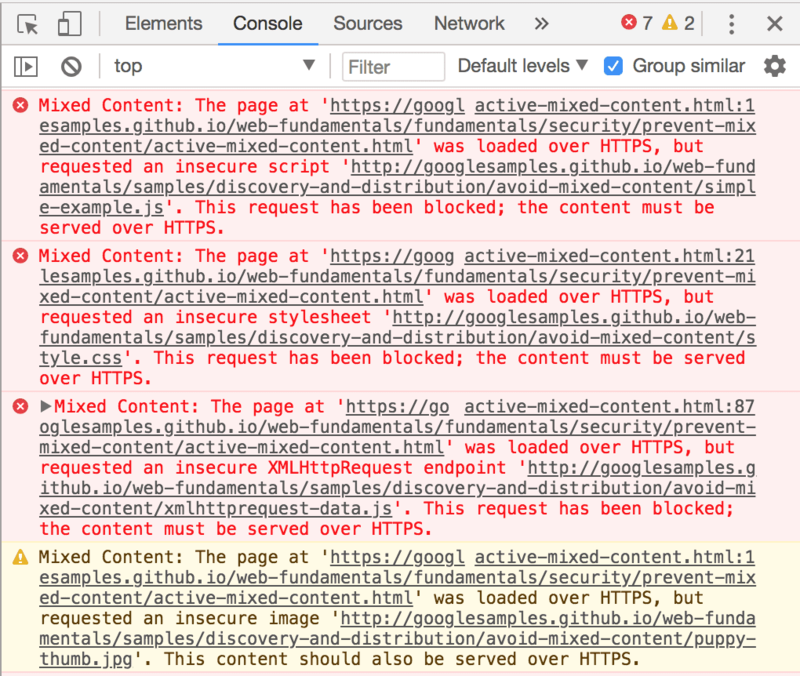 You may hear this referred to as “mixed content” — some content is secure, some is not. The key here is to find the culprit or culprits, then fix the code. Using Chrome, visit your site, right-click and choose “Inspect.” A module will appear displaying a lot of code. It’ll be indimidating, but fear not: 99.9% of it can be ignored. Look for a tab that says “console,” then click on it. See any results that look like this? That means you’re likely referencing non-secure content. You’ll need to update your code and replace each instance of http with https. If your site runs on WordPress, the easiest way to make this happen is with a plugin called Really Simple SSL. As soon as you install the plugin, you’ll be given a notification with a link that will allow you to enable SSL. Click it, and you should find that those mixed content errors are resolved. SSL certificates expire and need to be renewed often — but it’s a feature, not a bug. 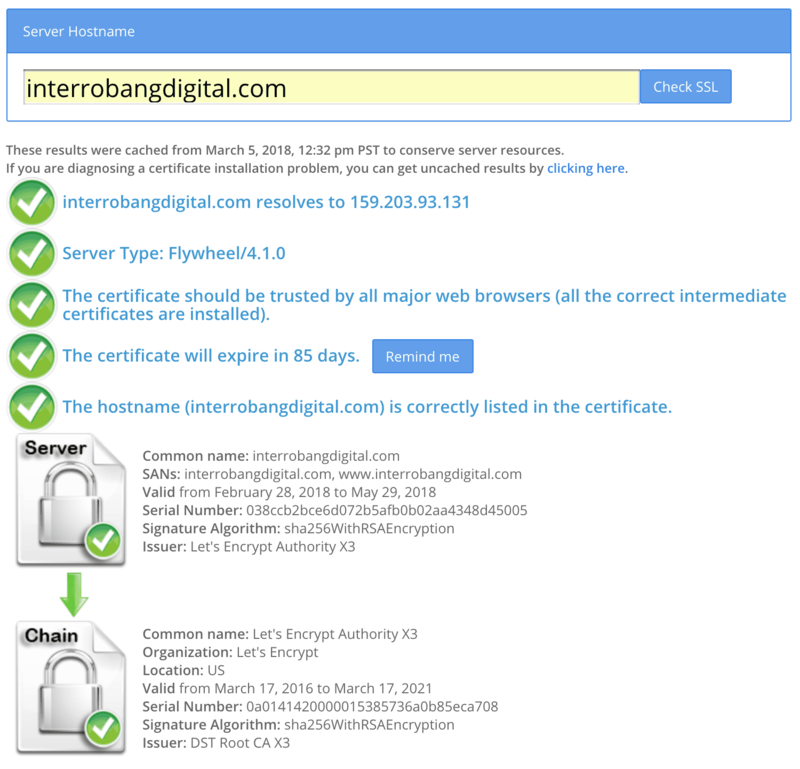 When a certificate expires, it must be re-authenticated by your web browser. Essentially it’s a check: I know this was secure a few months ago, but is it still secure? The good news: You can set your SSL certificate to auto-renew so you can set it and forget it. But if you don’t have auto-renew set up, or there was an error and auto-renew didn’t complete properly — you might run into this issue. Talk to your domain registrar (or check your account settings) to see if auto-renew is turned on. If not, make sure to renew the certificate and turn on auto-renew for the future. None of these solve your problem? There are other reasons your SSL certificate may not work, but they’re more technical than we should delve into here. If you’re still stumped, start a live chat and let’s see if we can get you up and running. Sometimes it’s not about if you can do something, it’s about whether it’s worth the hassle. Right Now, Get $200 Off Our Done-For-You SSL Installation & Configuration Services. But we want to help you double your leads and conversions. Get our weekly insights. Drive more qualified leads. Convert more leads into sales. And if you ever decide it's not helpful, that's okay -- unsubscribe at any time.